Tonight’s Menu: On this show, Scott discusses his Zenkaikon 2018 experience. 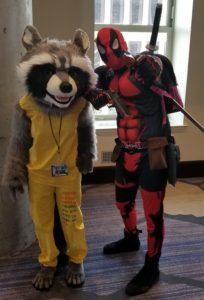 My journey to Zenkaikon 2018 was my third journey to this convention; every year has been unique and yet familiar at the same time. My daughter T joined me as my anime consultant for the podcast. She’s the one originally the blame for getting me into anime and manga; when I was growing up in the 70s and 80s, there was not a big cultural push for this type of animation. But I’m grateful that she introduced me to the genre. The Con started on May 4, 2018, and because of that, there were many people cosplaying Star Wars. After all, May 4th is Star Wars day. My daughter and I arrived on the second day of the convention, so we missed the actual Star Wars Day experience; still, there were tons of people dressed up in Star Wars getups. We starting the day by visiting Central Market. Really one of the things that makes this convention unique for me is its location; not only do you get to go and experience the convention and all it has to offer, but it’s in the middle of historic downtown Lancaster with wonderful restaurants and a Central Market that’s over 200 years old. It’s definitely something that you don’t want to mess. I ended up with the coffee, and my daughter bought donuts. Then we went to hang out in the lobby of the Marriott, technically Lancaster Convention Center, which is where Zenkaikon was taking place. It is located right off the square in Lancaster City. If you don’t take time to sit in the lobby of that hotel, you are really missing out. It is the perfect place to see all the cosplayers that walk into the convention center. Zenkaikon is a cosplay convention. In fact, if you don’t go in Cosplay, you really are in the minority. 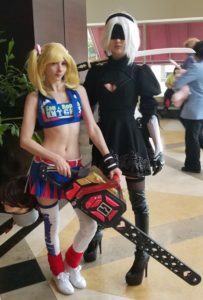 Nevertheless sitting in the lobby is a perfect place to experience and enjoy all the effort that went into the cosplay We picked up our press badges around 9:30 and we were in convention mode. One of the places we first stopped was the gaming room, where a Pokemon competition going on, a Magic the Gathering tournament was in progress, and many tabletop games were being played. But Zenkaikon also had a video gaming room where Nintendo talked about upcoming releases for the Switch. One could also play a lot of other video games. We attend Japanese karaoke for a bit; no we didn’t sing. 8^) We then attended a panel where characters from anime shows were shipped. The outcome was pretty hilarious. We swung by Central Market to pick up some lunch and came back to the convention to watch and judge AMV. We saw this last year and absolutely loved it. Or afternoon was spent interviewing some of the voice actors that attended this convention. 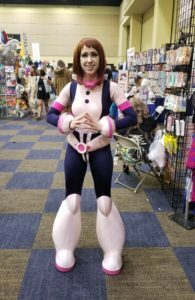 This year the convention brought in Jad Saxton, Sarah Wiedenheft, Jessica Calvello, and Quinton Flynn. All of them are very friendly and very amenable to the time set for our interviews; we only had about 5 to 6 minutes to interview them. We also spent some time in the dealers’ room. The dealer room is amazing; it has everything from manga books to outfits if you were trying to develop your own cosplay. Vendors had figurines, food, posters, and much more. We also spend some time in the Manga library where you could literally sit and just read Manga. There were thousands of titles available for you to read. Zenkaikon is going to be a bit early this year occurring March 22nd to 24th. You find out more about the convention and maybe score your pass to the 3 days of the convention a little bit early by clicking here. 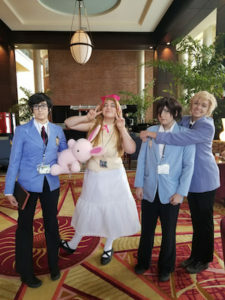 We will definitely be going back to the Zenkaikon Convention.